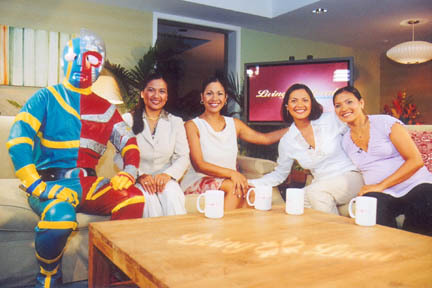 The Baraquio sisters get to meet cool celebrities on their Oceanic Cable show "Living Local With the Baraquios." On set with special guest Kikaida are, from left, Therese Baraquio Leterc, Angela Perez Baraquio Grey, Bernadette Baraquio Hamada and Rose Baraquio Harman. » Claudio and Rigolette Baraquio held valid teaching certificates when they arrived from the Philippines in 1970, but took hospitality industry jobs for immediate work. A story on Page G13 in the Sept. 12 Mauka-Makai section incorrectly said the certificates were not valid in the United States. THE BAND is back together -- sort of. After performing as High Tide during the annual "Brown Bags to Stardom" competition in 1991, sisters Therese "Tess" Baraquio Leterc, Bernadette Baraquio Hamada, Rose Baraquio Harman and Angela "Angie" Perez Baraquio Grey are working together once again, this time as co-hosts of "Living Local with the Baraquios" on Oceanic Cable's channel 16. New episodes air at 8 p.m. Sundays; repeats at 9:30 a.m., 2 and 8 p.m. Mondays; 2 and 11 a.m. Tuesdays; 2 and 5 a.m., 2 and 8 p.m. Wednesdays; 9 a.m. Thursdays; 5 and 10 a.m., 2 and 10 p.m. Fridays; and 7:30 a.m. Saturdays. "When we were kids, my mom used to make us perform everywhere we went," said Bernadette, who also serves as executive producer of the show. "We all took piano lessons when we were growing up." 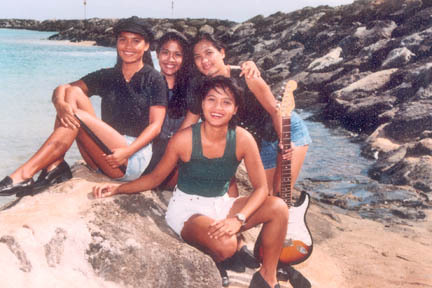 In addition to being in a band together, the sisters (Tess and Bernadette are identical twins; Rose and Angie were the next two children born into the family) also played varsity basketball and ran cross-country while all four were students at Moanalua High School. But according to Angie, "When you grow up in a family of 10, it's not easy getting to know who you are as an individual." Each of the sisters had to strike out on their own as part of the process of growing up, and once Rose became pregnant a few years later, it was evident that High Tide had come to an end. AS CHILDREN of Claudio and Rigolette Baraquio, Filipino immigrants who arrived here in 1970, the sisters were allowed a little more freedom than their older siblings had experienced at their age, but it was still tough being raised in a devout Catholic family. "We were very sheltered, and my mom and dad were very strict," said Bernadette. "We couldn't go out on weekends; we couldn't go out without chaperones." When Claudio and Rigolette discovered that their high school teaching credentials were not valid in the United States, they both took jobs in the travel industry to make ends meet. The family lived in Palolo Valley housing for a few years before moving into a four-bedroom house in Waialua and, later, a five-bedroom house in Salt Lake. By the '80s the Baraquios had started their own company, now known as Able Termite Control Inc., and enlisted the help of the older children to look after their younger siblings. "We all had a buddy system growing up," Angie explained. "The big ones would partner with the small ones, (and) we always looked out for each other." With only three years separating Tess's, Bernadette's, Rose's and Angie's birthdays, the four sisters were often referred to as a collective. "We did everything together," Angie said. "(But) everybody had their own issues that they had to deal with, and I think that manifested itself in a lot of fights." The other Baraquio sisters pull no punches, either. "We had our share of drama," confirms Rose. "We have problems like every other family. ... Especially having 10 kids, you can't all be equally close. "But in the end, we are family and we back each other up. ... Our parents really instilled a set of strong moral values in all of us." In the early 1990s, the Baraquio sisters played music together as "High Tide." Rose is in the foreground; behind her, from left, are Bernadette, Angela and Therese. IT WAS Bernadette's second pregnancy that got the ball rolling for "Living Local with the Baraquios." After taking maternity leave from her job as a television reporter at KHON, she realized that instead of going back to work, she wanted to become a full-time mom. Doing so was the "best decision I ever made," she said. Once she left KHON, the opportunity arose for Bernadette to host "Hawaiian Classics," a program that airs on OC-16 and focuses on island music from decades past. That helped spark the idea for her to create another show that would allow her other family members to participate. "When she brought it to the table with all of us there, we were just blown away," said Rose of her sister's idea to bring them into the fold. "We were like, 'Why didn't we think of this before?'" Said Bernadette, "I thought it was a no-brainer. ... It was always my dream to work with my sisters." Described as a half-hour entertainment talk show, "Living Local with the Baraquios" covers a variety of topics each week. Each sister writes and produces her own segment for each episode. According to the show's Web site, Rose covers top restaurants and their signature dishes, Tess visits island attractions and local hot spots, Angie focuses on notable community figures and Bernadette shares the histories of different local icons. "I think it's really a blessing to be able to work with my sisters in this capacity," said Angie, who had the opportunity to work with a number of different production companies during her reign as Miss America in 2001. "I think it's brought us closer together as sisters. ... We've all gotten more respect for each other and our abilities to get things done." FILMED ON location at the Turtle Bay Resort, the new episodes of "Living Local with the Baraquios" present a positive form of family programming that the sisters think fills a niche within the local community. "I think we reach a really broad audience," Angie said. "We show the importance of family, the importance of community and pride in not only being Filipino, or whatever your heritage is, but in being born and raised in Hawaii and having that type of identity. "We've gotten a lot of great feedback saying that (viewers) feel that they can connect with us," she said. According to Rose, not only is the show an opportunity for the public to get a glimpse of what it's like to be part of the Baraquio family, but it also gives the women a chance to get together. "We feed off each other," Rose said. "It feels natural for us to be on camera and to talk about our experiences together. "Even though it's a job, it's time for us to spend with each other and really get to hang out with each other." And don't be surprised if other members of the Baraquio clan end up making an appearance on the program, either. "I think everybody (in the family) is pretty much a ham," said Bernadette with a laugh. "In the upcoming episodes of this season, we're going to introduce our parents ... and our brothers."